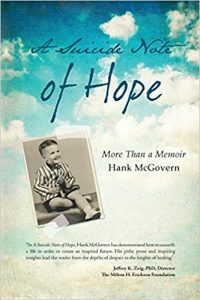 ISEPP's Hank McGovern has come out with a book on suicide prevention. Check it out at Amazon. Hank speaks from personal and professional experience. Take a look at his recent interview below with Michele Paiva, ISEPP's marketing guru. The book has received 5 stars out of 47 reviews so far. From one review: "The author artfully uses the dramatic frame of a suicide note and a tumultuous, well-drawn childhood to take readers through his quest for meaning, peace, and balance...His encapsulations of various therapies, particularly rational emotive behavior therapy, are soulful and illuminating, and emphasize the power of practical, positive action and behavior...Overall, this is an evocative, intriguing, self-exploration...sometimes overwhelming, yet compelling..."